Join us and co-ops from around the South Sound area to celebrate co-op values and principles. The Co-op Village will pop-up in our parking plot (5th Avenue and Adams in downtown Oly) on April 28, 2018 from 2:00 pm – 7:00 pm. Visit with area co-ops and credit unions before, during, and after the Procession of the Species. 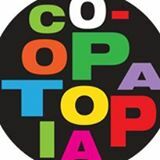 Coopatopia is #37 on the Olympia Arts Walk Map.